Looking for some creative, geeky gifts for the holiday season? Wanting to gift the geekling in your life with something a little bit different that will spark their imagination? Just wanting some good gift ideas for the geek kids in your life? Look no further! 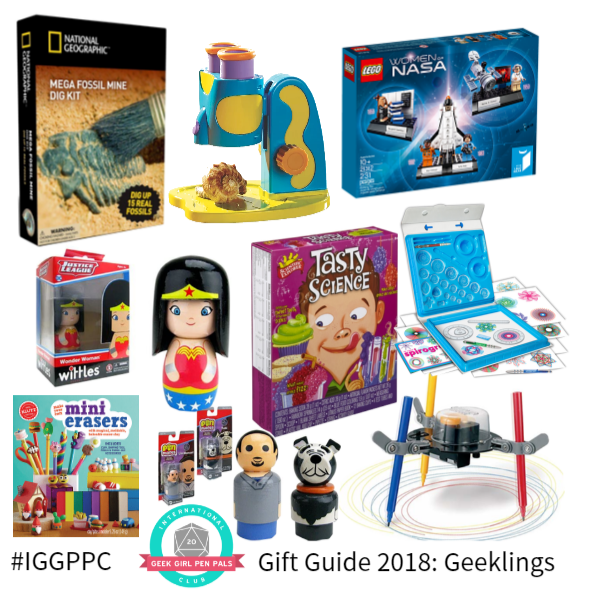 Here’s a round up of some fun things to gift your geeklings this year! Here’s what’s on my list, starting in the upper-left corner of the image above! National Geographic has a pretty sweet collection of hands-on kids like this Mega Fossil Dig Kit, including one where young explorers can excavate gem stones if colorful rocks are more up your geekling’s alley! This GeoSafari Jr My First Microscope has been a big hit when I’ve given it in the past, so I’ve kept it bookmarked for quite a while. It’s easy to use and safe for smaller geeklings to get them started in STEAM just that much sooner! I love LEGO and I love space and what’s better than combining them into one great gift? The LEGO Women of NASA set includes so many of my favorite things, I might need to get a set for myself! This Wonder Woman Wittles doll debuted at San Diego Comic-Con 2018 and I had an opportunity to play with one then. I love the way this doll feels in my hand– it’s got good weight and is so smooth, plus it brings back all the childhood nostalgia of wooden peg toys! While this doll may be more of a collectible, Entertainment Earth ALSO makes peg dolls for kids, including this AWESOME Lin Manuel-Miranda doll that comes with his dog, Tobi! Most of these ideas are things I’ve given myself, or have had experience with. The Tasty Science kit, however, is just something that has piqued my interest! It’s got chemistry and food all rolled into one, and looks like it could easily be scaled up (thanks to recipe cards) to do with multiple kids! Okay, so this one is a full-on dose of nostalgia. The Original Spirograph set was one of my FAVORITE toys as a child, and I spent hours making different spiraling patterns, so it makes me beyond happy to see that it’s still available for kids today! This is another one that I would have LOVED as a kid! Klutz products tend to be creative and fun, and this Make Your Own Mini-Erasers book looks like it ticks both of those boxes. And it comes with the clay you need to get started! While this may look similar to the Spirograph, this 4M Doodling Robot is actually a tiny robotics kit! Add some tech to your spirals and see what your geekling can whip up with this little robot artist. These products are for a wide range of ages and interests and are meant to act as a springboard for gifting ideas. Got any good gifts for geek kids that we missed? Leave them in comments below to help your fellow shoppers!